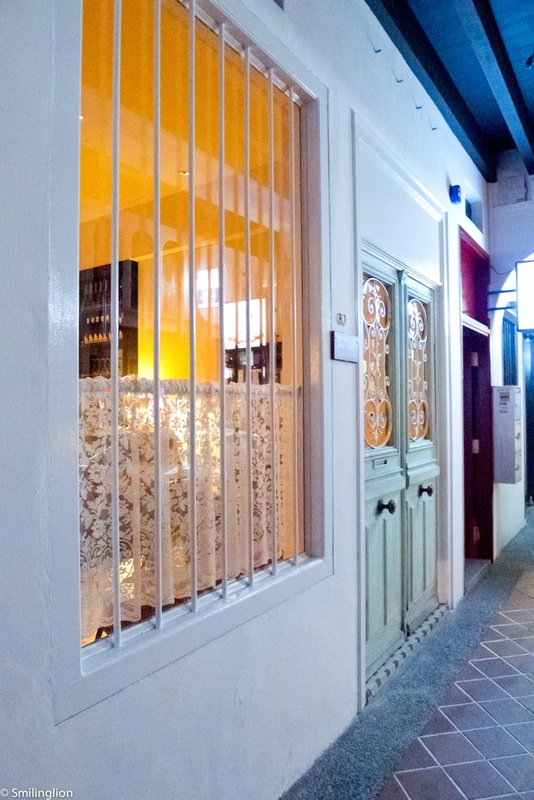 Update: Shinji (Raffles) was awarded 1 Michelin Star in the inaugural Michelin Guide for Singapore in 2016. 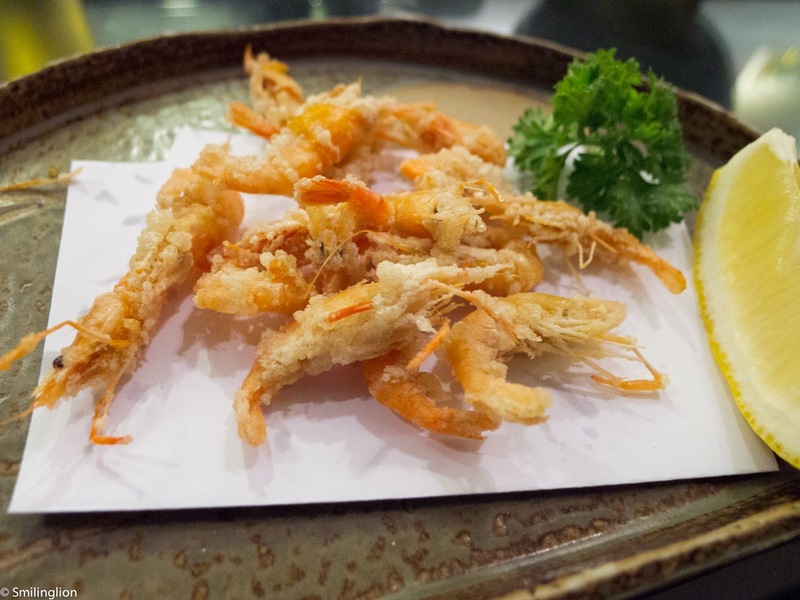 When it was reported that the famous Chef Shinji Kanesaka from Tokyo was opening an outlet in Singapore, it caused quite a stir. 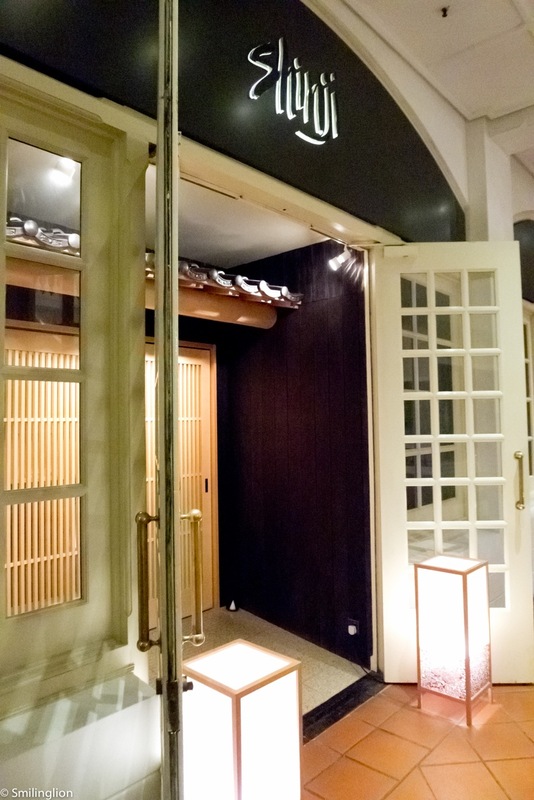 After all, this was the first Michelin-starred edomae sushi restaurant (Sushi Kanesaka has 2 Michelin stars in Tokyo) to venture to Singapore, during the time when the integrated resorts were opening up and attracting celebrity chefs from around the world. 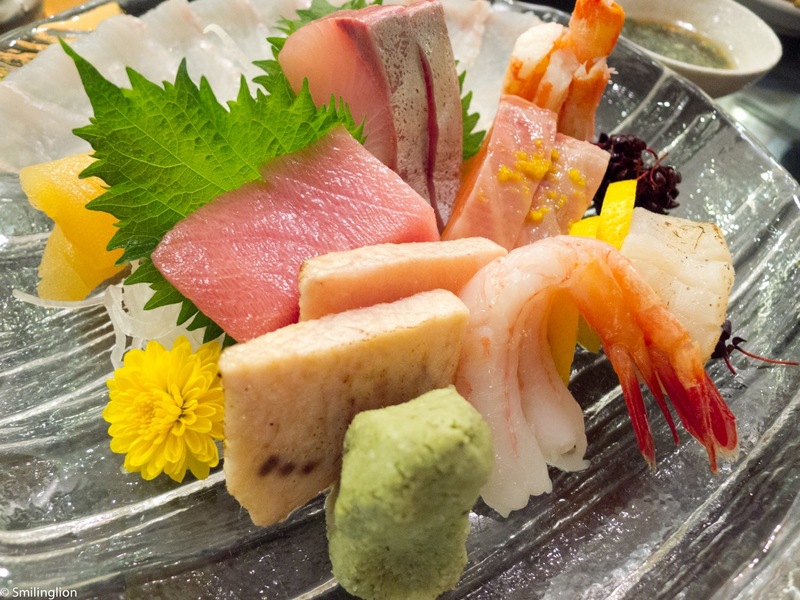 What made the top sushi restaurants in Tokyo famous was the combination of the freshest ingredients and the skill of the top sushi chefs in Japan, and this was not easy to duplicate outside Japan. It takes many years to qualify as a sushi chef, and it wasn't so easy as to train within a short time a team of local chefs to run a similar setup in Singapore; which means that Chef Kanesaka either had to come down himself to run the restaurant or send his trusted lieutenants to do so in his stead. Shinji was first opened at Raffles Hotel in Singapore, and recently opened a second outlet in the central business district. 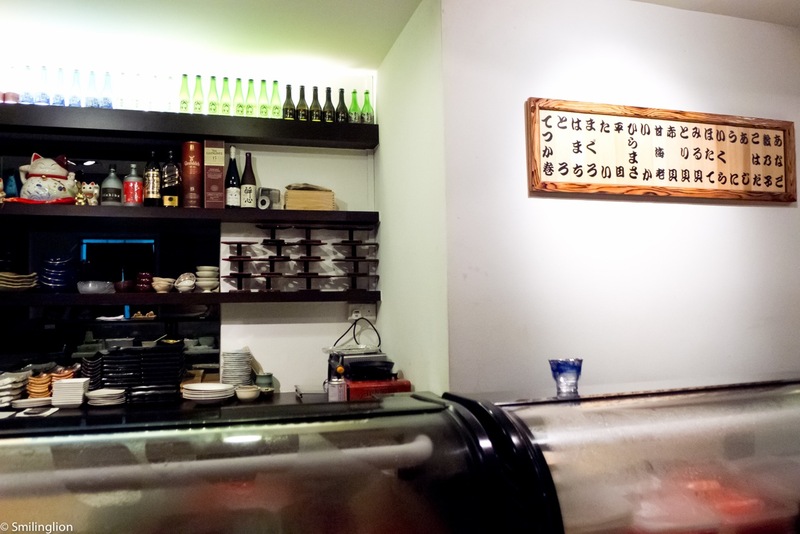 It is a classic sushi counter capable of seating 15-17 people and has an 8-person private room at the back. At the counter, there were 3 sushi chefs that night serving about 5 persons per chef. 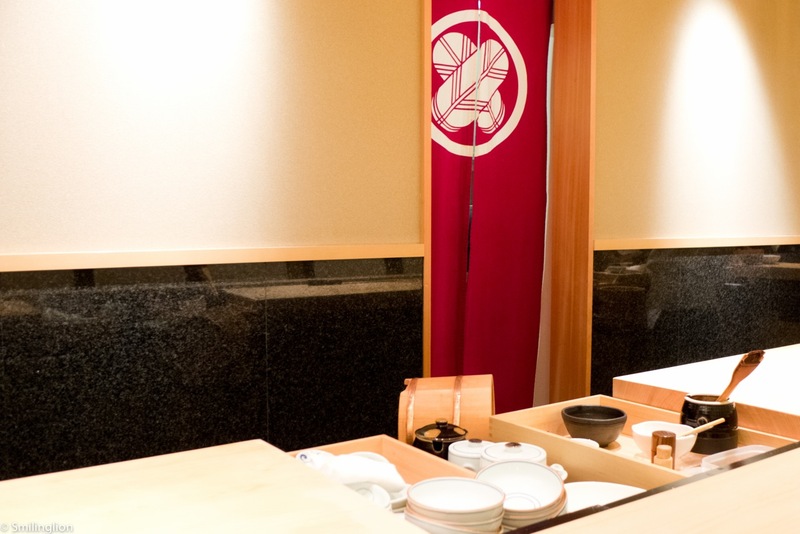 As the night went on, we were more and more impressed by how similar dining here was to our experiences in top sushi restaurants in Tokyo, with the distinct difference of how each of the Japanese sushi chefs were deliberately trying to communicate with each guest in English. This wasn't the typical sushi counter where the surly chef dumps food on your plate and expects you to get on with it, on the contrary, each chef was consciously making small talk and trying to explain to each guest the food which was being served, with as much humor as possible. This was even more impressive given that each chef was not fully fluent in English yet was so clearly trying his best to speak to all the guests. 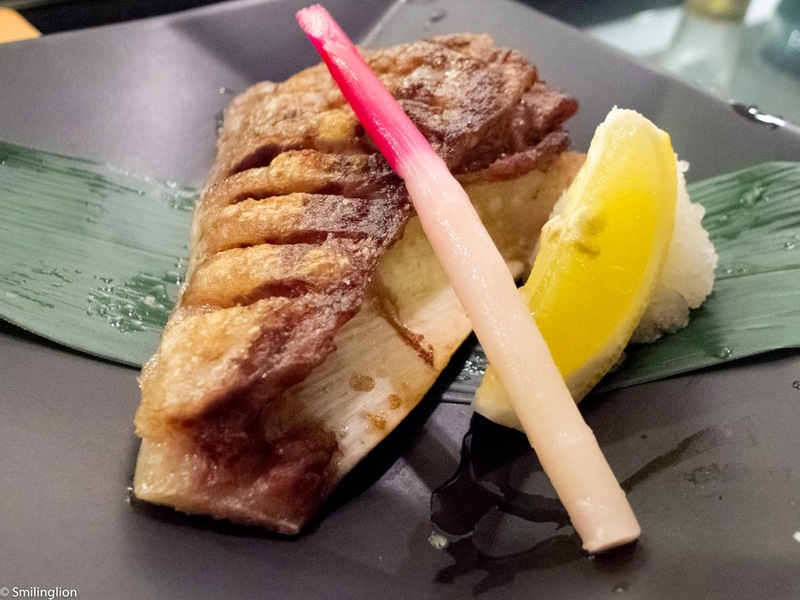 In all, it was a very interactive experience, which was like what we observed in Tokyo in many of the more intimate and high end sushi restaurants (except that in Tokyo, because we don't speak Japanese, we tended to be left alone). 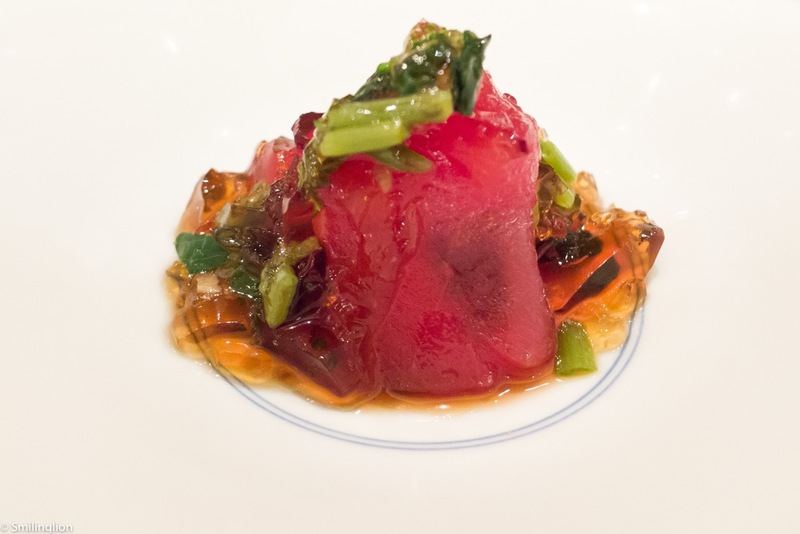 We were started off with some tuna sashimi with a very interesting soya sauce jelly and wasabi leaves. This was delicious and raised our expectations for the evening. Next up was seared Japanese barracuda and a type of clam (didn't quite catch the name). 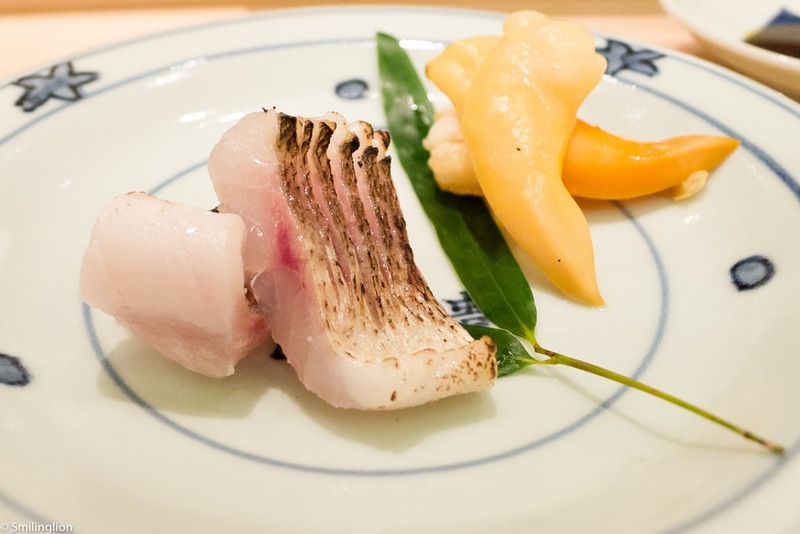 The barracuda (an unusual raw fish for us), was smoky on the outside and soft and juicy on the inside. The white shrimp and sea urchin were a fantastic combination. 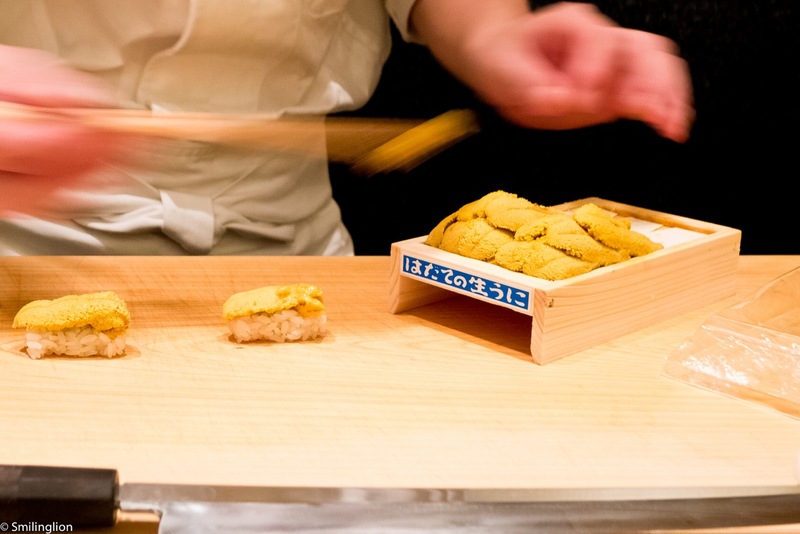 The sweetness of the baby shrimp and the refreshing taste of the top notch uni were a superb pairing. The cooked dish was a deep fried fugu (puffer fish) which was cooked to perfection (and not too dry as it can tend to become). Even the chawanmushi was different, as it was cooked with sea bream stock instead of the usual bonito stock and it tasted less eggy than the usual. However, it was also done with plum sauce which we thought made the dish a bit too sour. 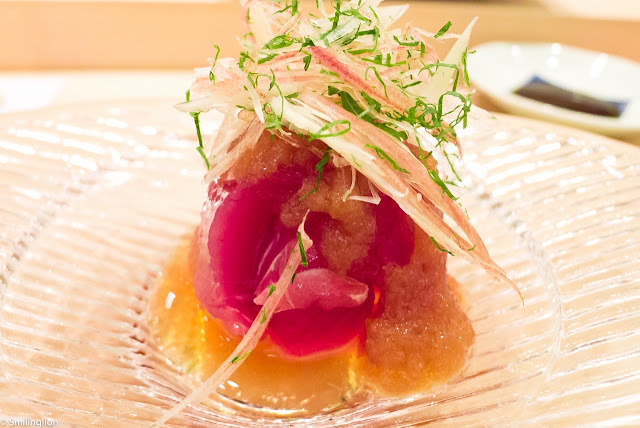 The katsuo sashimi (or skipjack tuna otherwise known as bonito) was doused in a 'secret sauce' and covered with Japanese onions and was very good. 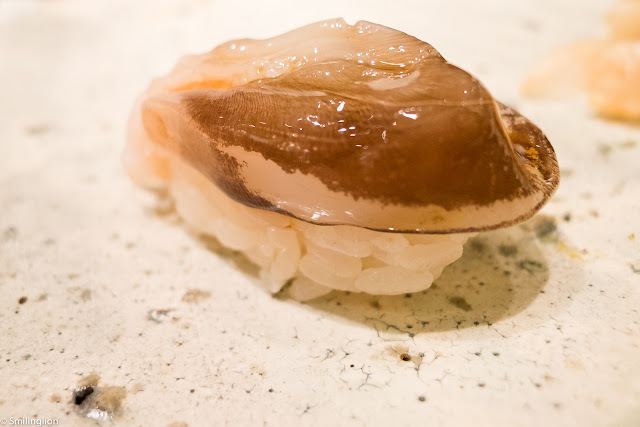 The next dish was a seasonal produce; the raw baby squid which was amazingly fresh and tasty, and despite it looking like it wasn't gutted, we didn't taste anything strange which could have been its innards. These baby squid apparently light up at night in the sea, much like fireflies. Then came the sushi. Our chef started chopping up the fish first to lay out nicely on a platter, just to whet our appetite on what was to come. 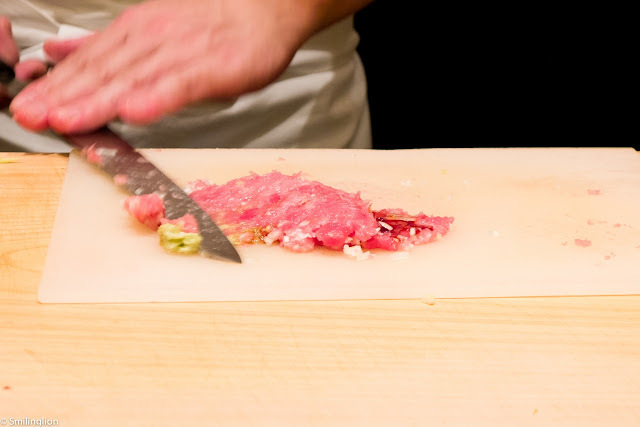 In the photo below, he was slicing out a few pieces of otoro (fatty tuna). We found quite interesting that when the sushi was to be served, the waitress took away our soya sauce and wasabi, as in this restaurant you don't need soya sauce or wasabi as the chef will make the sushi in a way which doesn't require you to add any further condiments or sauces. First up was a lightly seared madai (red snapper). 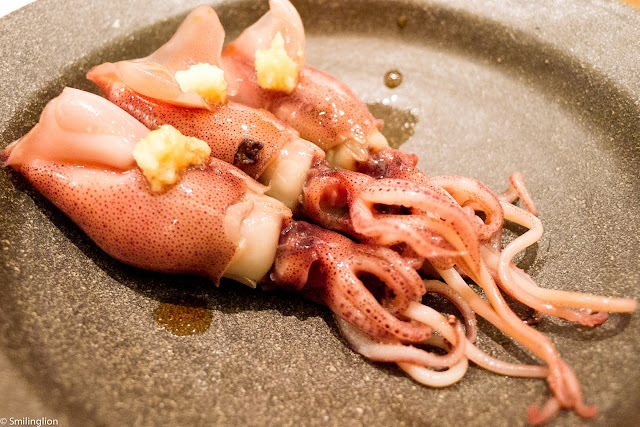 The ika (squid) was very interestingly prepared. 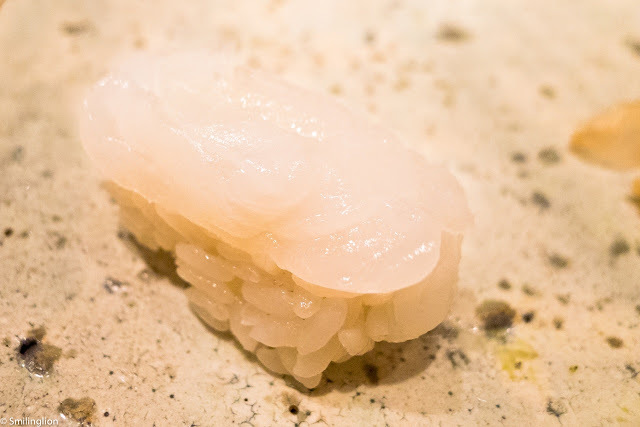 The chef sliced it very thinly before packing it together on the rice, making it much easier and softer to eat (raw squid can be quite chewy). 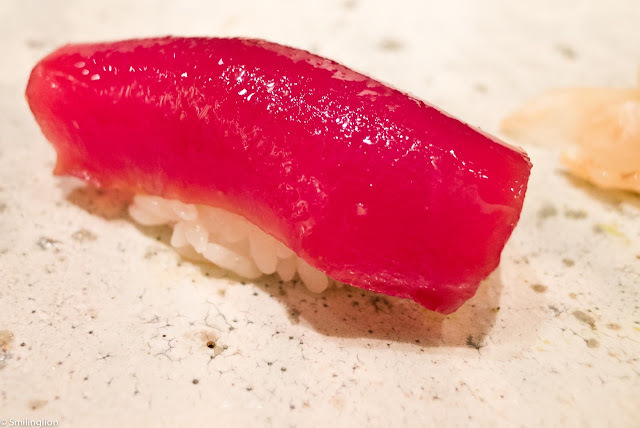 The chu-toro (medium fatty tuna) was next. 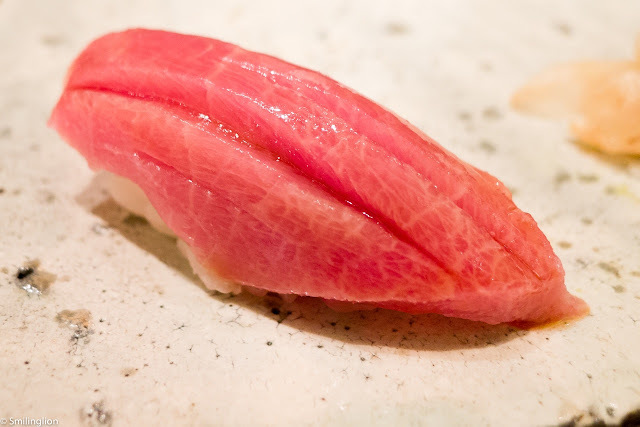 Then the otoro (fattier tuna) which was more marbled. 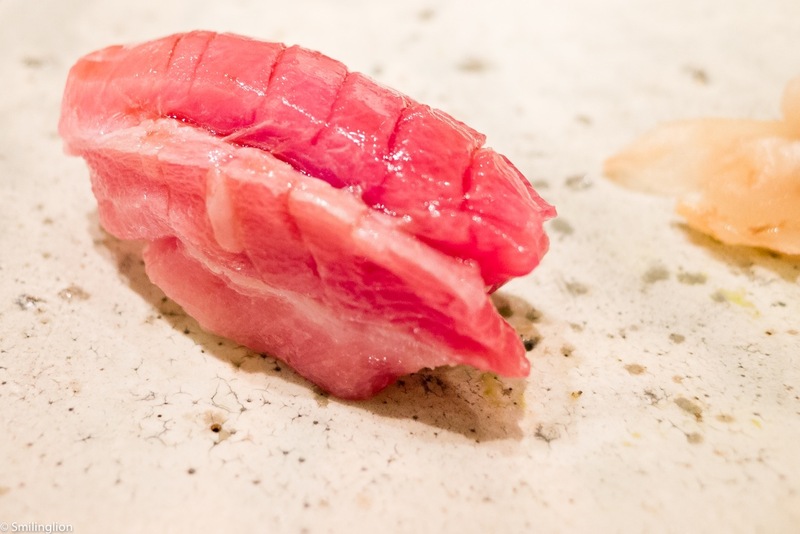 Typically we prefer the chu-toro as the otoro can taste too fatty (though many will disagree and otoro is usually more expensive). The aji (mackerel), one of my favourite sushi, this time made with less ginger than usual, giving it a lighter and fresher taste. Another piece of maguro (tuna), this one glistening in its freshness and with a brush of marinate over it. 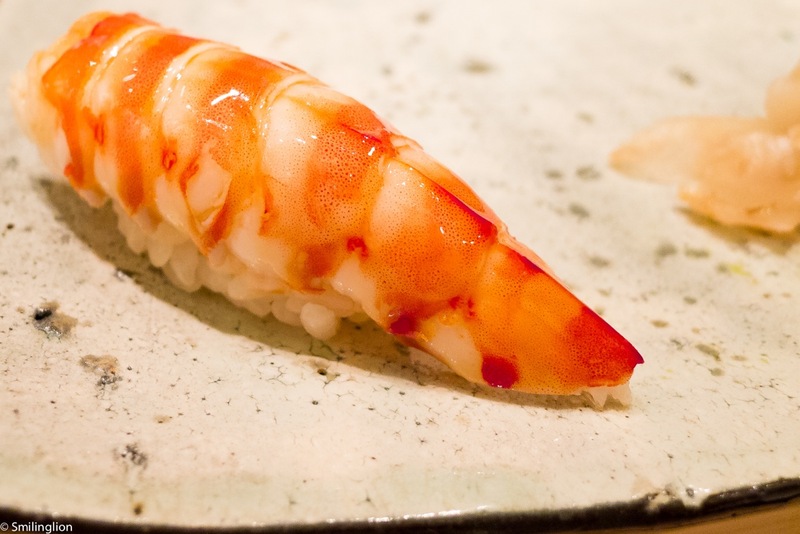 The cooked ebi (prawn) was special in that under the prawn was some minced dried shrimp which gave it a more savoury flavour. 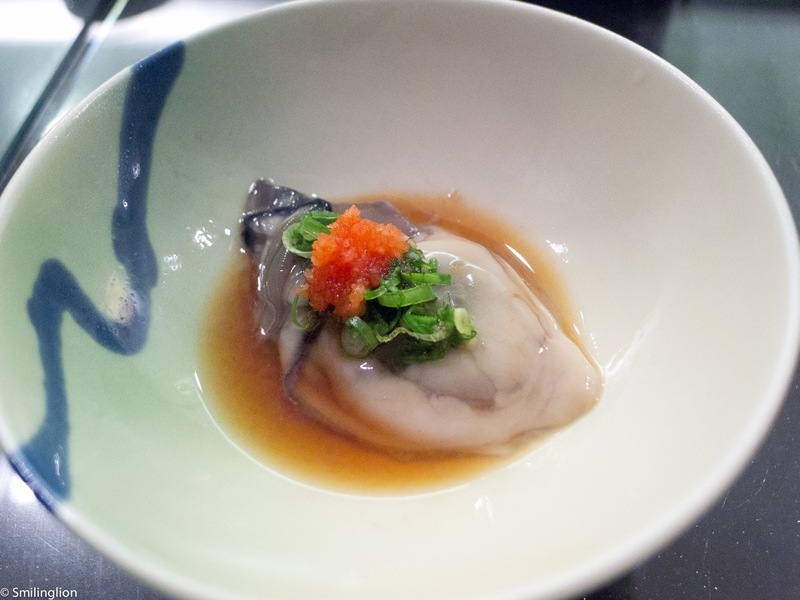 The next piece of sushi was a unique clam which was softer than the usual and tasted somewhat like oyster. Uni was next and this was a different one from the earlier sea urchin, as this was from the sea urchin with the longer spikes and hence had a more bitter taste. It was likewise very fresh and an excellent sushi. 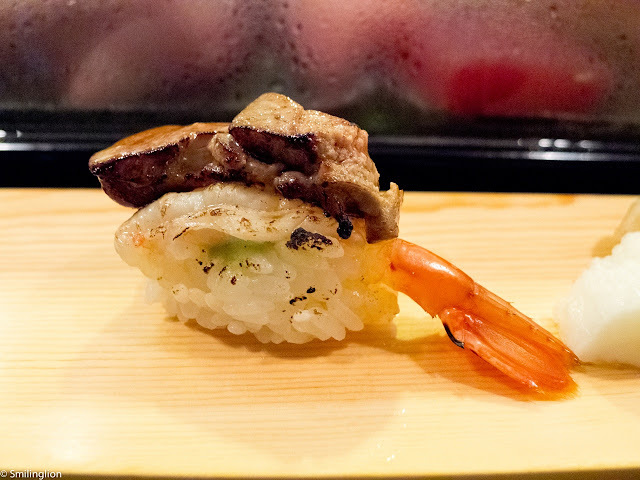 The last piece was the anago (saltwater eel). What was special about each piece of sushi served was that it was thoughtfully put together, some with a brush of soya sauce or other sauce, some with a sprinkling of yuzu, but all on perfectly vinegared sushi rice expertly handled by our sushi chef. Each was a masterpiece in its own right and as simple as it looked, was probably the culmination of many years of training. 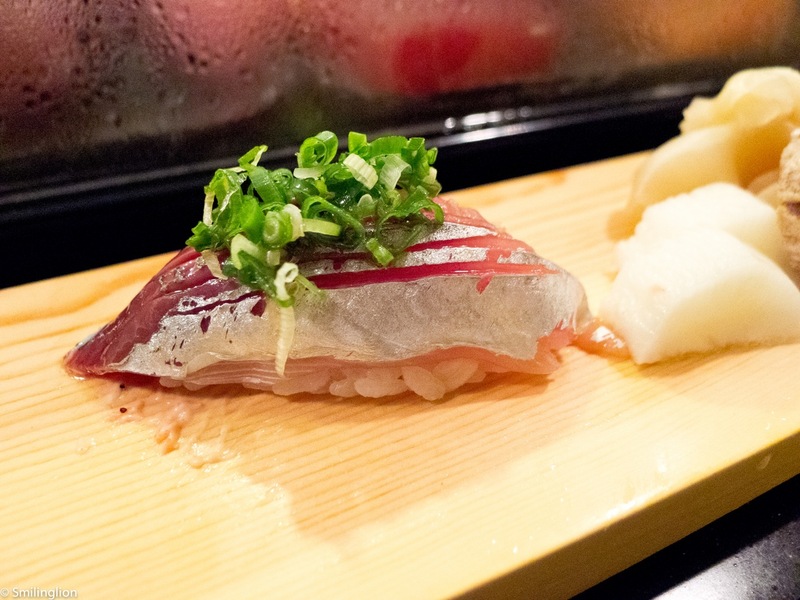 In addition, Shinji imports its produce directly from Tsukiji market in Tokyo four times a week, which is two more than most other Japanese restaurants in Singapore, hence ensuring that the fish in particular is as fresh as possible. 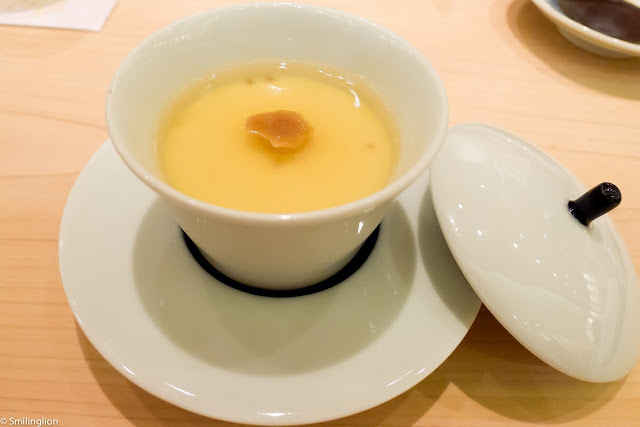 And to further remind us of Tokyo, we were served the tamago (egg) which was so soft that it tasted more like an egg custard. 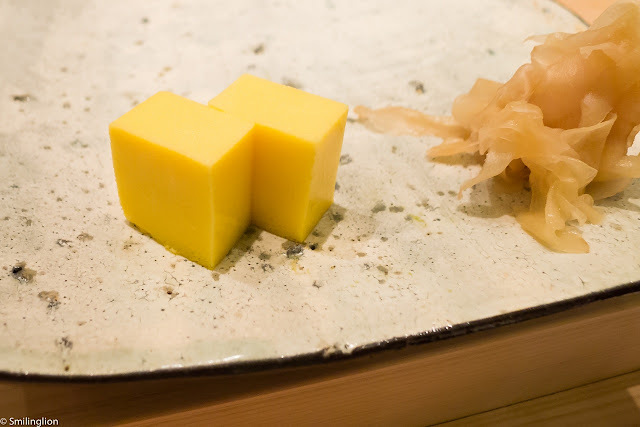 This is the standard of tamago in the top restaurants in Tokyo and we were pleasantly surprised that they could do it here as well. According to the chef, this was painstakingly made over charcoal fire for one hour in the morning. It didn't end there (normally once the tamago has been served, the sushi meal is over). The chef made us each a negitoro (chopped fatty tuna) hand roll. 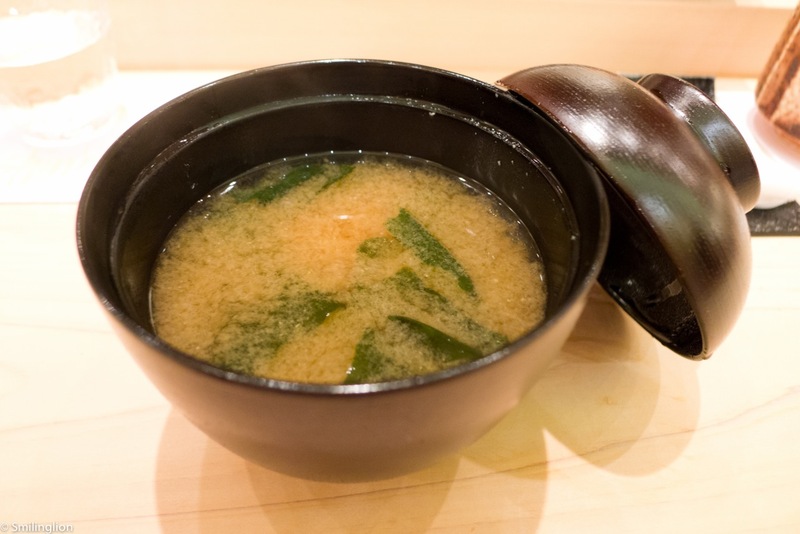 Soup was a light and tasty miso soup. 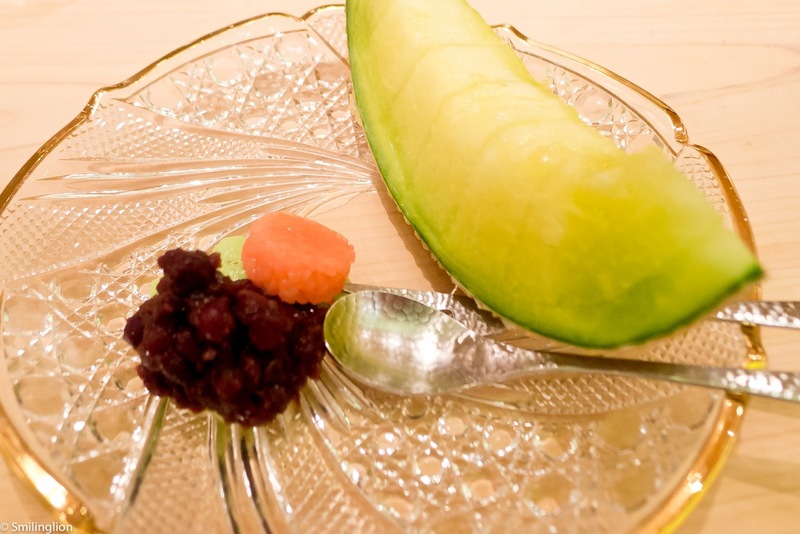 To end off the meal, we were served a rock melon from the base of Mount Fuji which was very sweet, and accompanied by red beans, green beans and a small glutinous rice ball. Final Thoughts: An excellent meal. 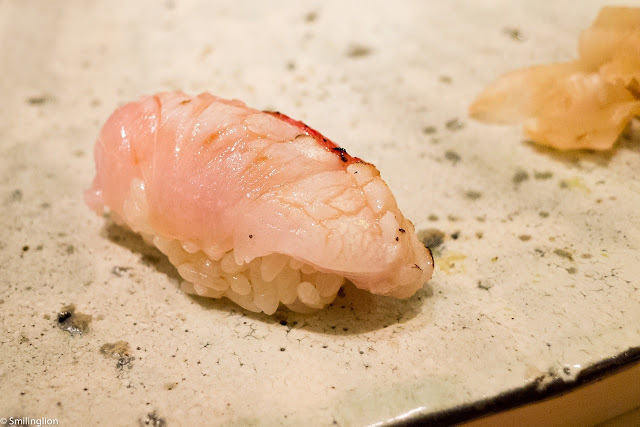 We didn't think it was possible but Shinji replicated the memorable sushi meals we had in Toyko, yet without our awkwardness of trying to communicate with non-English speaking chefs. We liked what Chef Kanesaka is trying to achieve in Singapore, i.e. 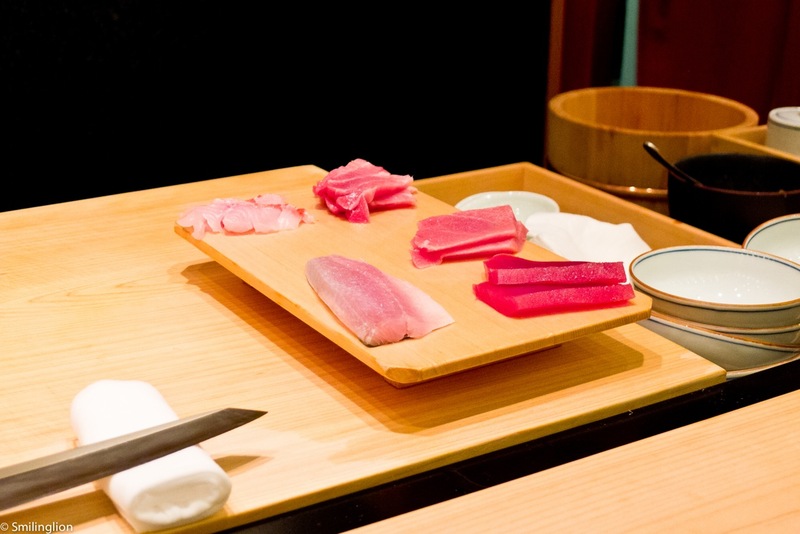 to bring the traditional experience of edomae sushi dining to Singapore. It is interesting that each of the Japanese chefs there were specifically instructed to communicate with each guest in English (our chef was actually told off by another chef when he had to call a waitress to translate something to us into English). 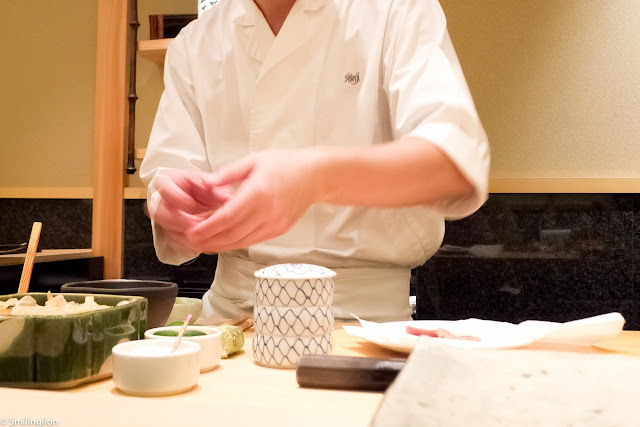 It shows that Chef Kanesaka is not setting up a high-end Japanese restaurant which, like in Japan, is very inaccessible to non-Japanese speaking diners, but is actively trying to make it easier for Singaporean diners to understand and appreciate this style of dining (i.e. where the sushi chefs interact closely with the diners). To add to that, the food and the sake were all top notch and we didn't feel that it was in any way inferior to those we have had in Japan. In addition, we liked that the prices were clearly stated in the menu (we had the Omakase Wa which cost S$300 per person) which is similar to the restaurants we have been to in Tokyo, hence we avoided getting sticker shock when we got the bill at the end of dinner (which can happen in some other high end Japanese restaurants in Singapore which don't state the price upfront). Tucked rather discreetly along an old street of shophouses in Tanjong Pagar dominated by bridal salons, Korean restaurants and KTV parlours is a relatively new French bistro opened and run by a French couple, Frederic and Charlotte Colin. The entrance is a pale green wooden door which is always closed and the first time I went there I actually walked past it without finding it, and had to backtrack after looking at the unit numbers. 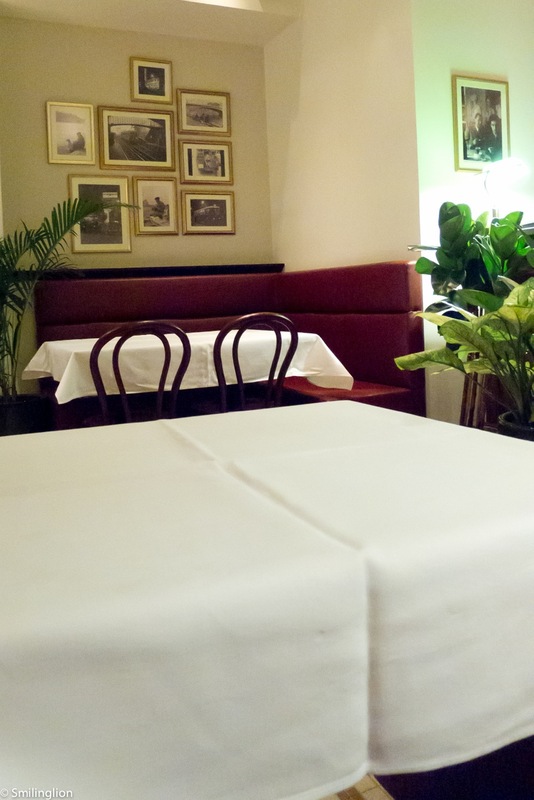 The restaurant was tastefully decorated in the style of a traditional french bistro, with a bar counter at the entrance and the dining room set further back into the space. Tables covered with starched white sheets were quite tightly packed (the diner behind me brushed against my back with his elbow twice that evening - that's how close he was sitting to me) but there was an energy about the restaurant, brought about by the boisterous diners (especially during dinner time). 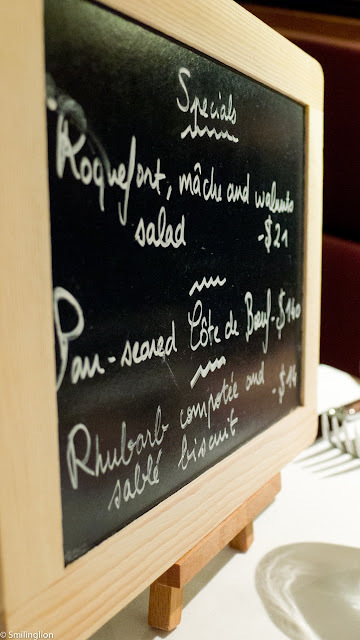 For each time that we have been here (including a weekday lunch and weekend dinners), there was always a healthy crowd of French-speaking diners, which gave us comfort that the French food here was probably quite authentic (because it certainly wasn't cheap). Specials were presented to us by way of a small chalkboard placed on our table. We found it quite interesting. 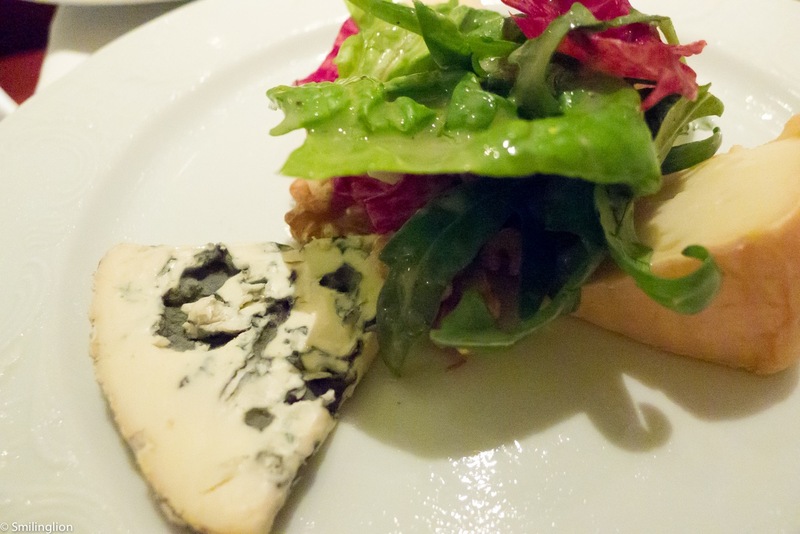 The chef likes to serve salad with blue cheese as it was one of the specials that night and there were another 2 salads in the a la carte menu which were similar (one of which, the endive salad, I tried before and liked). 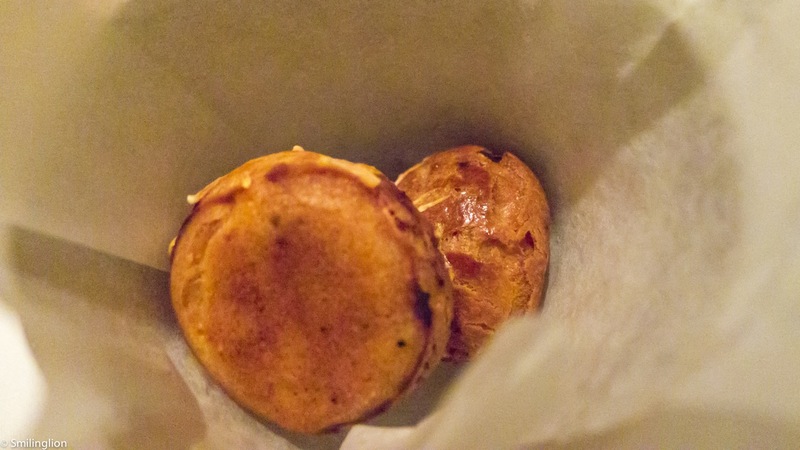 While we were considering our food options, we were served gougères which was a very nice touch and gave the place a slightly more upmarket feel as opposed to the regular bistro (our love for cheese puffs is apparent from the title of our blog). They were a bit starchy (compared to those we've been used to) but putting things into perspective, they weren't that bad. "Tsarskaya" oysters from Brittany: We started dinner with a half dozen of these rather large oysters which were fresh and briny. 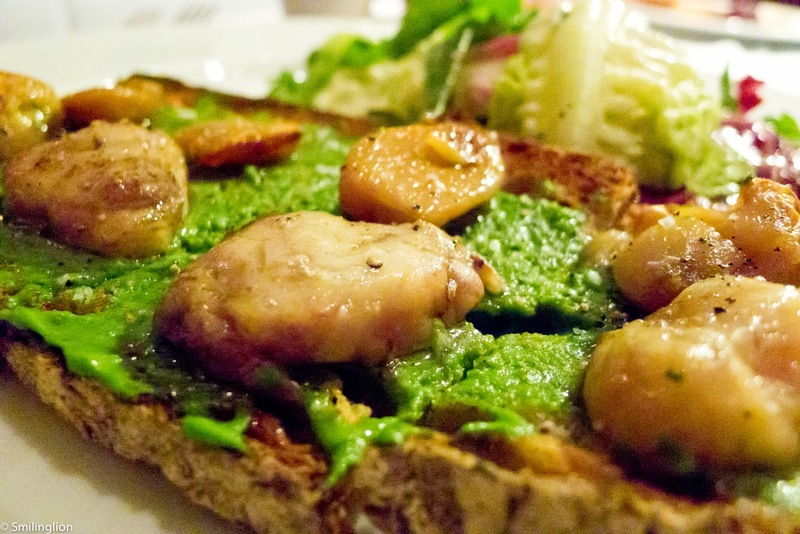 Bone marrow on Poilane bread with garlic confit: A daring choice but one which turned out to be a great one. Bone marrow can sometimes be hard to eat if not cooked properly but this one was done very nicely (it was scooped out of the bone) and served on a crispy thick slice of bread with a rich garlic spread. A very nice combination (though it left me with a killer garlic breath for the rest of the evening). One complaint was that the salad accompaniment was too damp and doused too heavily in vinaigrette (resulting in it being unbearably wet and sour). 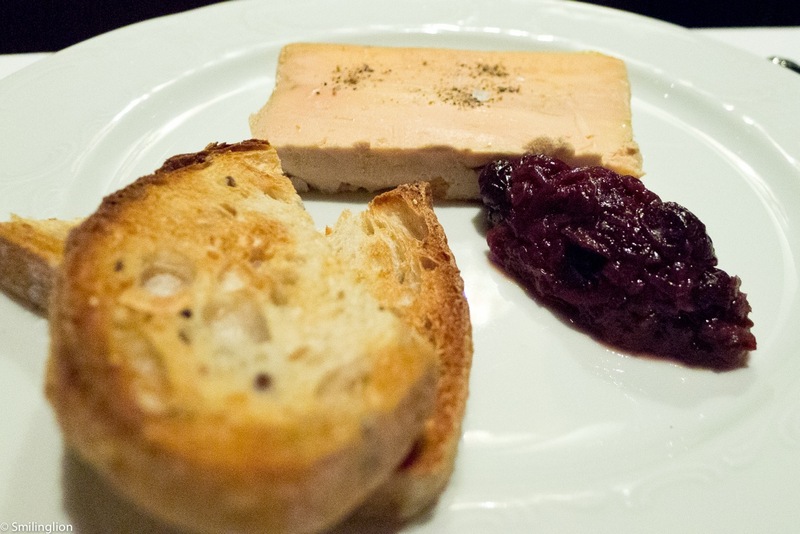 Grandpa Henri's baked pork terrine with duck liver: The duck terrine was of the right consistency and flavour. The hot toasted bread was delicious too and though there was a compote on the dish, the terrine didn't need it at all. Hand-cut Angus beef with condiments and French fries: Essentially, a steak tartare, which is something I rarely find in Singapore (perhaps raw beef hasn't really caught on here). 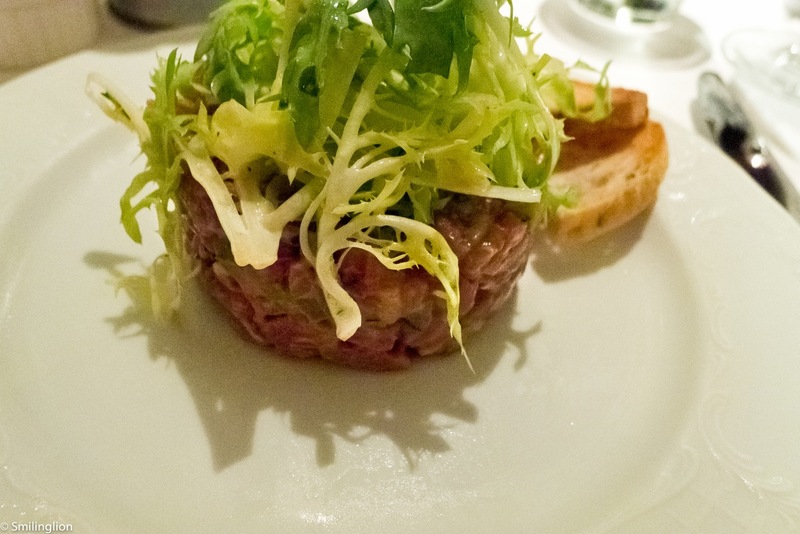 I love a good steak tartare and this was pretty good, although I felt that the beef was too rough cut and could have done with being chopped more finely. Once again the salad was too sour and was unnecessary for this dish. The fries accompanying the steak tartare were excellent. 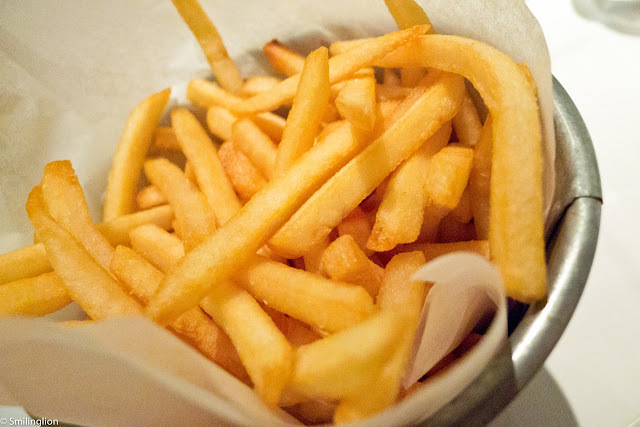 We've tried the fries here at other times and it has always been good here. 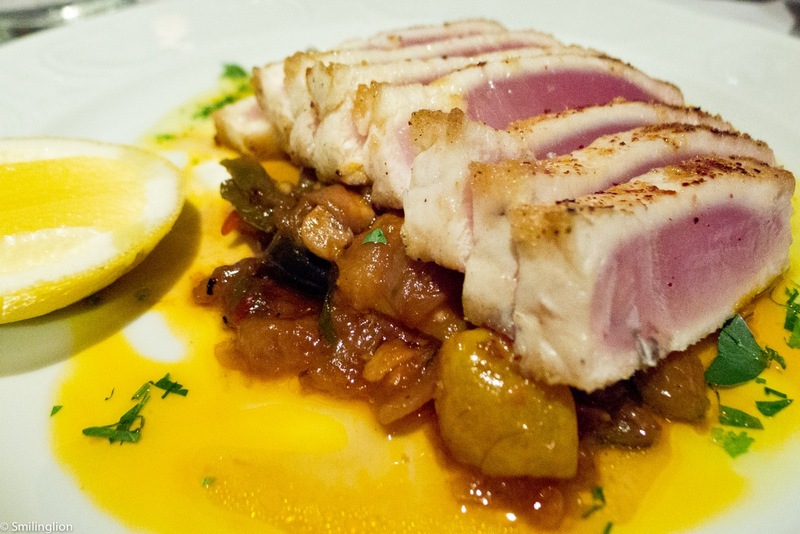 Pan-seared white tuna with Provencale ratatouille: This was supposed to be sea bream in the menu but because they ran out of the fish, it was replaced with white tuna. 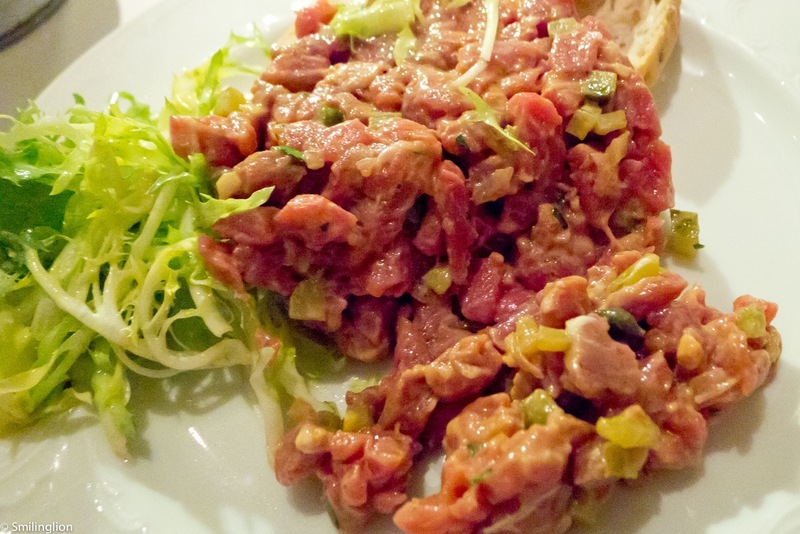 We are not the biggest fans of tuna done in any way other than raw (i.e. sushi/sashimi), but this was very good. We then ordered a cheese platter which was to be followed by the dessert but somehow they ended up serving both at the same time, which was quite awkward as cheese and strawberry millefeuille don't go well together, so we'll chalk this down to a 'miss' by the service staff. For the cheese, they were 3 classics: camembert, livarot and roquefort. What was puzzling was the reappearance of the over-vinegared salad again, which was a totally bizarre addition to a cheese course. It was as it the kitchen had a 'salad guy' (i.e. a person who's sole job was to make the salad; albeit in this case, badly) who insisted on putting his salad in almost every dish, even though it didn't really go. 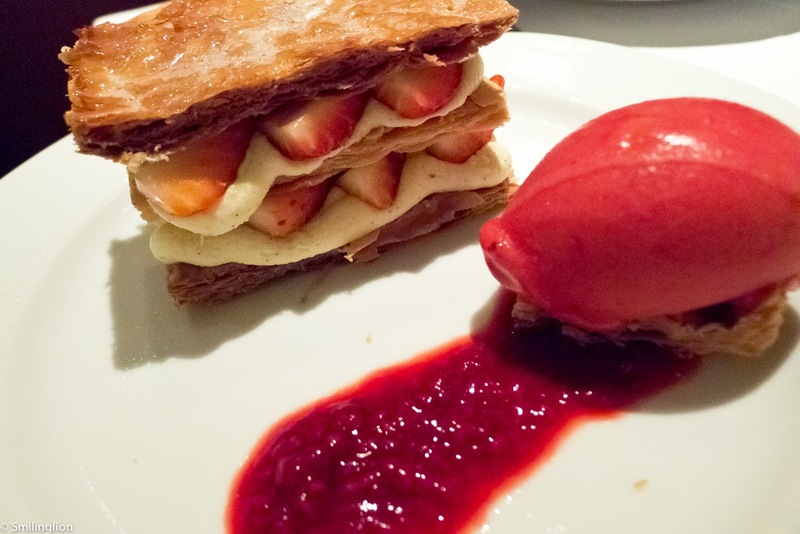 The strawberry millefeuille was excellent though. The strawberries were sweet and the cream was thick and fresh. The pastry had a nice crispy texture without being too doughy or oily. The raspberry sorbet was also very addictive. This was a high quality dessert for a bistro. 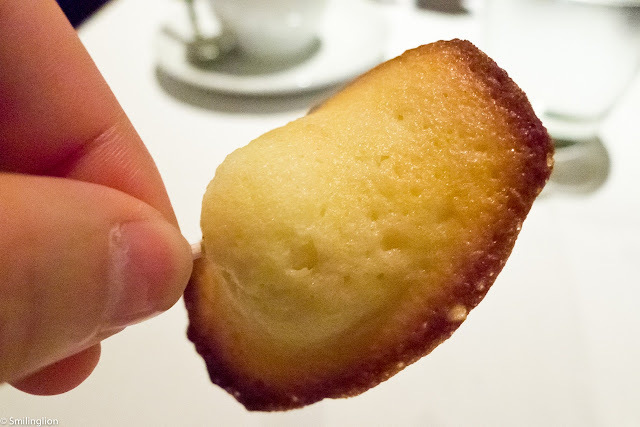 A nice touch was the madeleines. 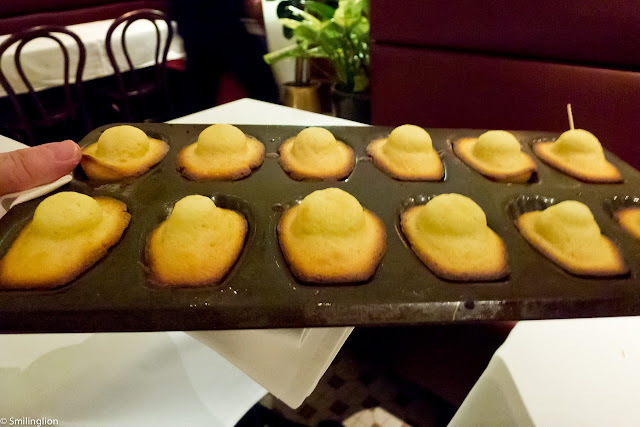 At the end of the meal, the waiter brought out a tray of freshly baked madeleines served on the molds themselves. They were perfectly made with the soft and spongy interior and slightly burnt and crispy ends. This was another example of something extra which we didn't expect from a bistro. Final Thoughts: The food here was not cheap and when placed in context that this was supposed to be a bistro (from its dining concept, its decor and it's menu), it may have seemed over-priced. 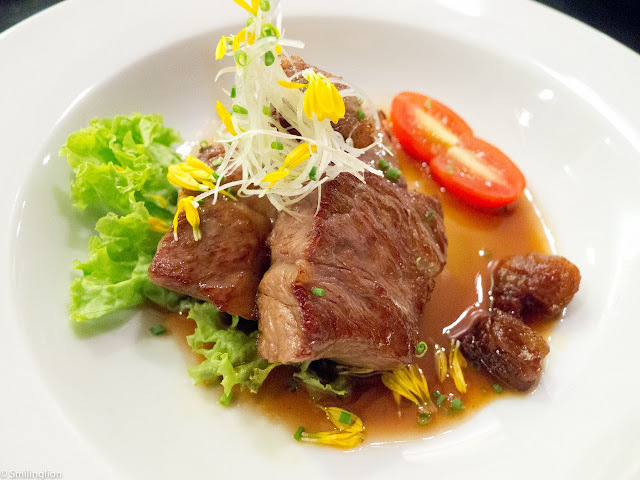 However, the food here has been consistently good in the times we have been here and the menu is very adventurous with some french classics which may not be for the typical Singaporean palate. We think we'll probably find better and cheaper steak frites elsewhere, but for the less common delicacies of bone marrow, quenelle (the fish foam dish we had during our last dinner here) and steak tartare, they are probably amongst the best we've had in Singapore. 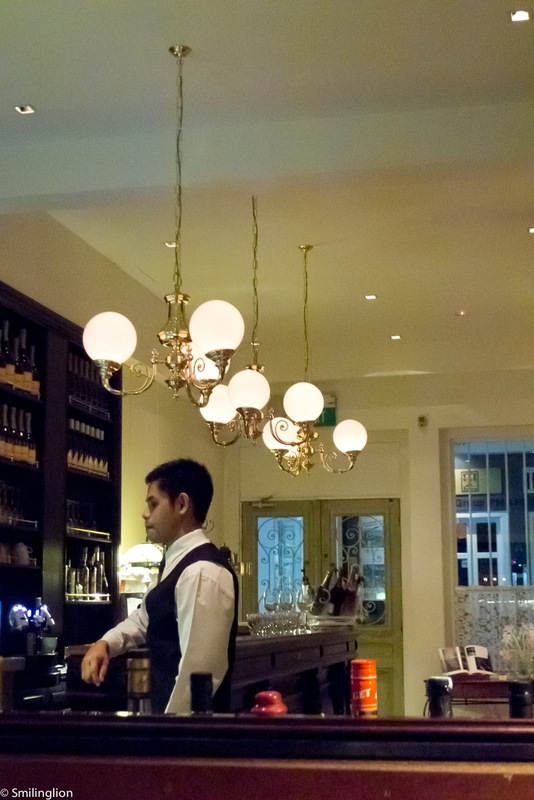 Service can be bistro-style (i.e. rushed and curt at times) but some thought has clearly been put in the wine list and the wines here are quite good. Update: Chefs Lawrence and Gary have both left Hinoki. We come to Hinoki quite regularly, and usually do so when we want a relaxing but good quality sushi and omakase meal. We don't usually bring our camera when we eat out in Singapore (otherwise we'd have to write a blog post every other day), but this time we had just got our new Leica DL-5 and were still very keen to try it out wherever we go. The last time we posted on Hinoki (see earlier review: Hinoki), we used our iPhone to take pictures, and the photos weren't as nice as we'd have liked (understandably). So we thought we'd bring our new camera and see if we can do the place and food justice with our photos this time. It was a Saturday night and the counter was relatively empty when we got there (it did fill up eventually; we joked that it was the IT fair and half of Singapore was probably there, given how much we like these events. People did turn up for dinner after the IT fair ended). Chef-owners Lawrence and Gary were behind the counter, assisted by their sidekick Kenny. 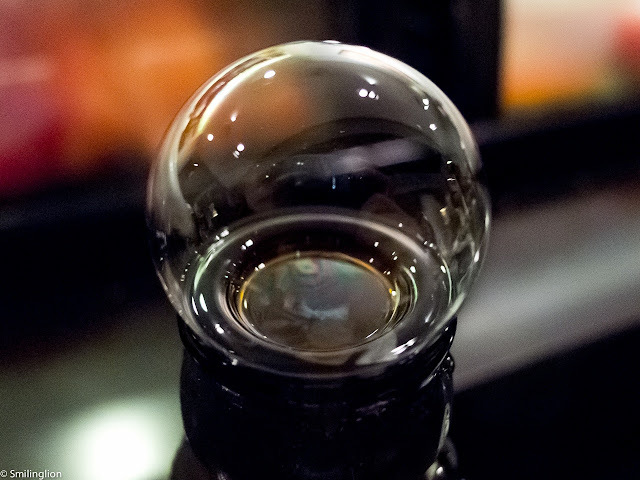 We had Sapporo beer, which was excellent and always a good beverage with Japanese food (below is a frivolous photo of a bubble on the beer bottle after the beer was poured). As usual, we left the menu in the hands of the chefs, and were started off with the raw oyster with soya sauce marinate (I find myself having oyster a lot here, the chefs must like oyster very much. 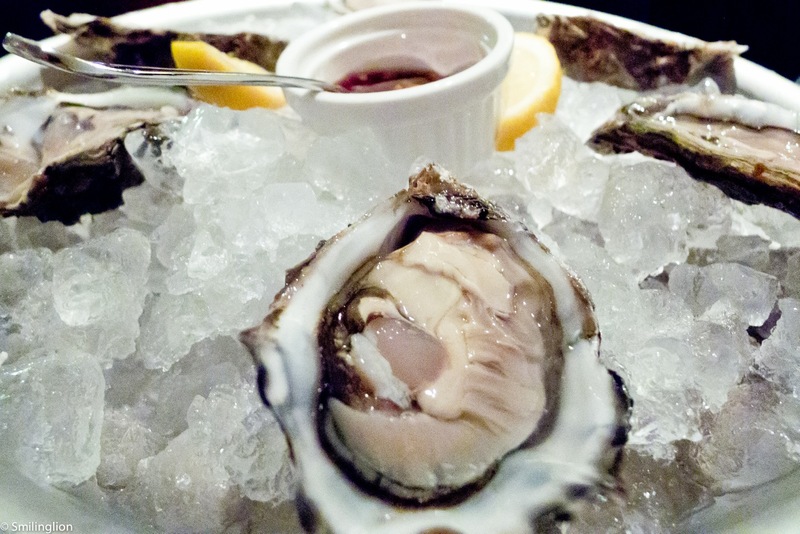 Those people who don't like oysters should tell the chefs before the meal begins). Very fresh and juicy. Deep fried shrimp were tasty and nicely breaded as well. 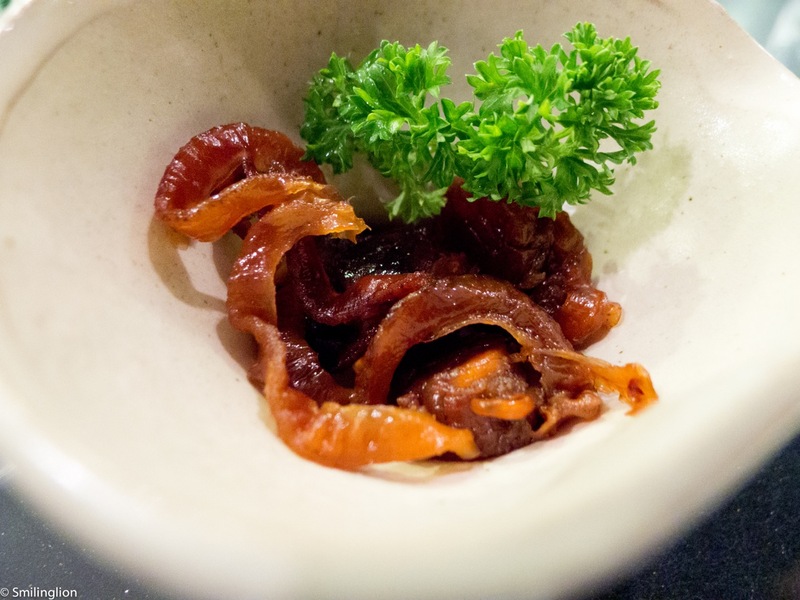 Marinated dried scallops were chewy but like beef jerky were very addictive after a few mouthfuls. The sashimi platter was bountiful with a good selection. What was new this time was the flounder (the thinly sliced white fish behind) which was supposed to be paired with a specially concocted truffle oil-based sauce and chives and was unbelievably good. The cooked fish dish was the tuna neck. This took us by surprised as the meat was quite heavy (didn't taste like a fish) and could have passed off as a tender pork rib. It was very nicely grilled. The Japanese wagyu (from the Kyoto region) was also quite good. The cut wasn't the best (I think it was the flank or rump and it was chewy) but still it was very flavourful and the accompanying sauce was good. Then came the highlight of the evening, the sushi. 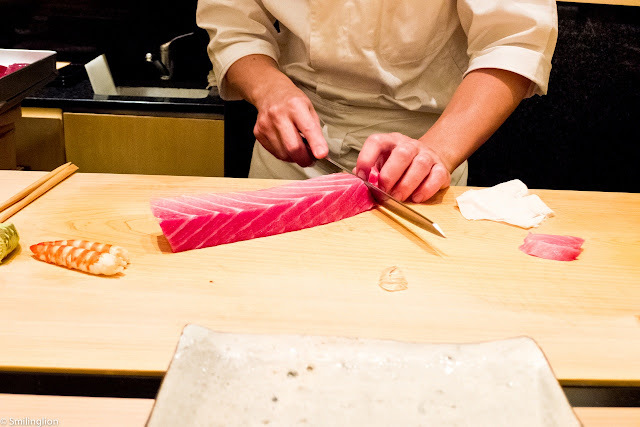 Meticulously handmade with the freshest fish, sushi is Hinoki's speciality. 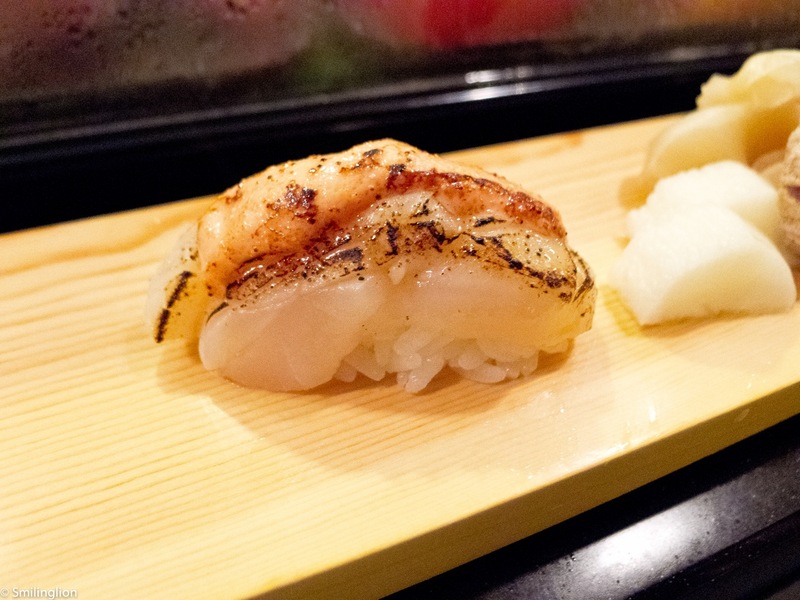 No run-of-the-mill stuff here, the rice is typically well vinegared, and the fish sometimes raw and sometimes slightly seared to bring out the fatty flavours. 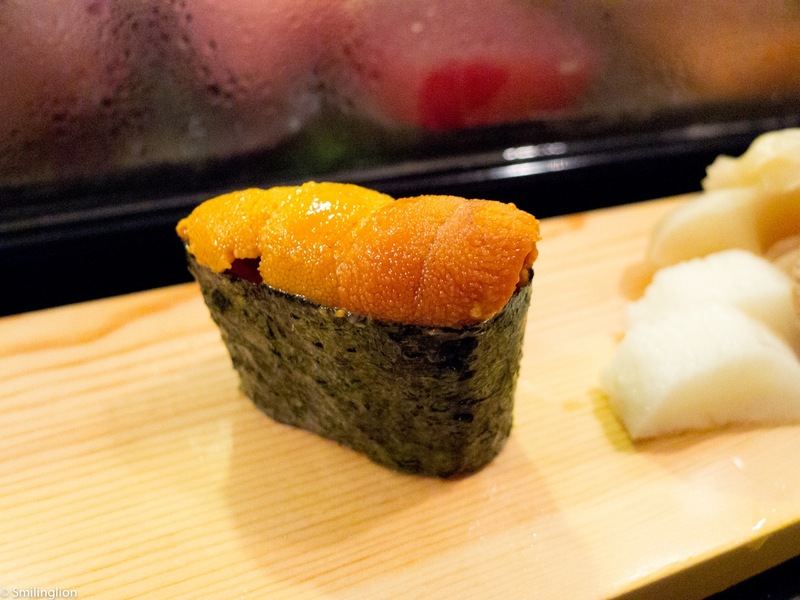 Most of the time, the sushi is well flavored and does not require any soya sauce. 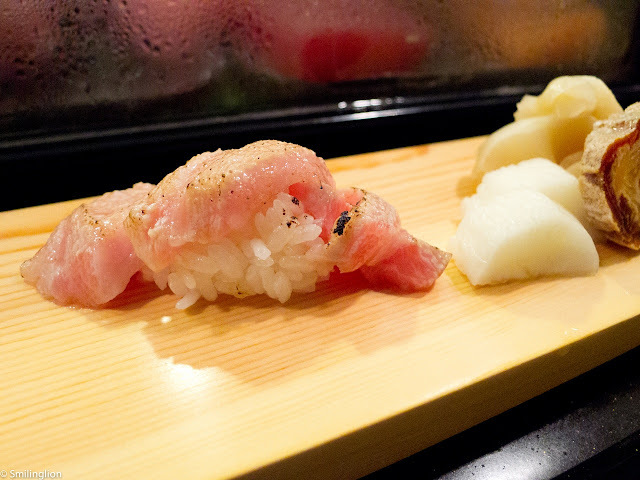 First up was the toro (tuna belly), lightly seared to give it a slight charred taste. The uni (sea urchin) was exceptionally fresh that night. It was so good we ordered another one for each of us. 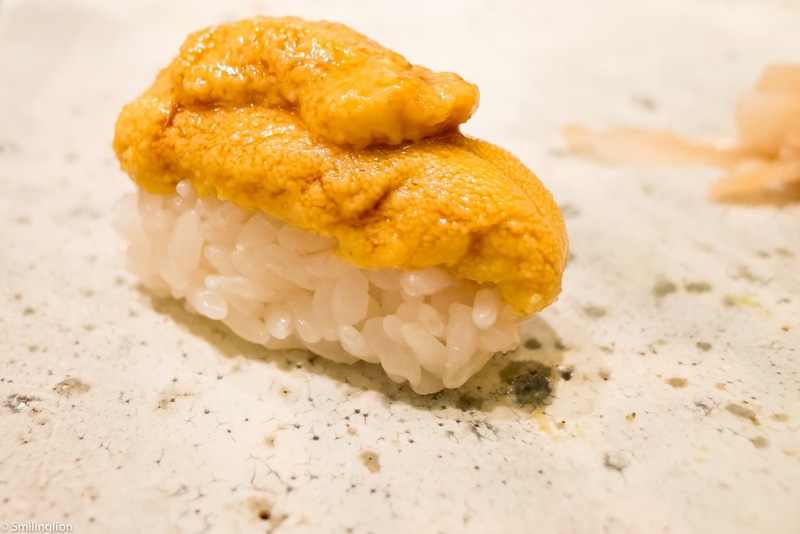 Poor quality uni is usually a bit mushy with a metallic taste and may smell like puke, but the freshest and best ones, like the one we had here, had none of that smell and taste and had a uplifting and slightly sweet flavour. Heavenly. 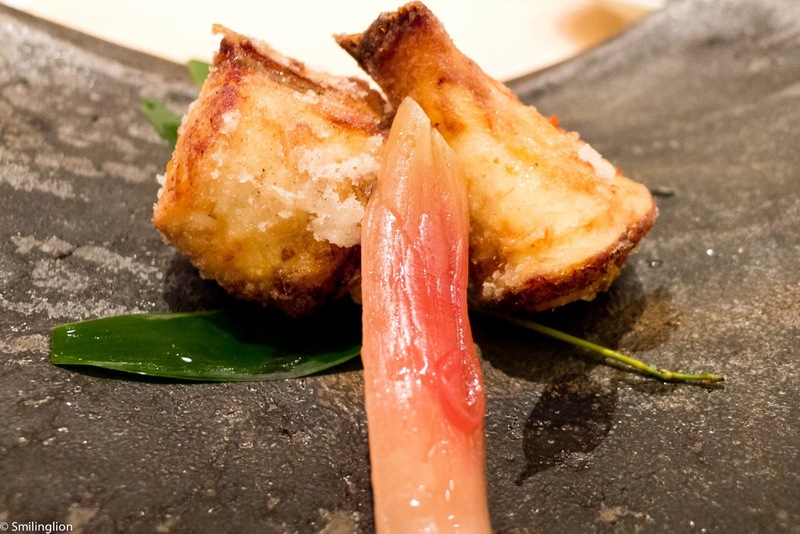 A Hinoki favourite is the seared ebi (prawn) with seared foie gras. Decadent and a good combination of tastes. 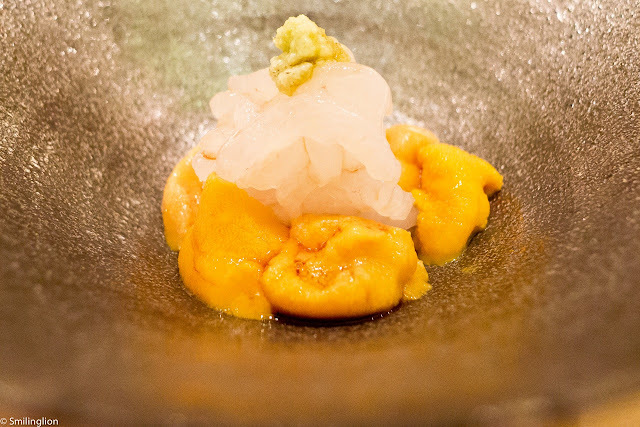 Next was the hotate (scallop) with mayonnaise . Another Hinoki favourite and very nice. 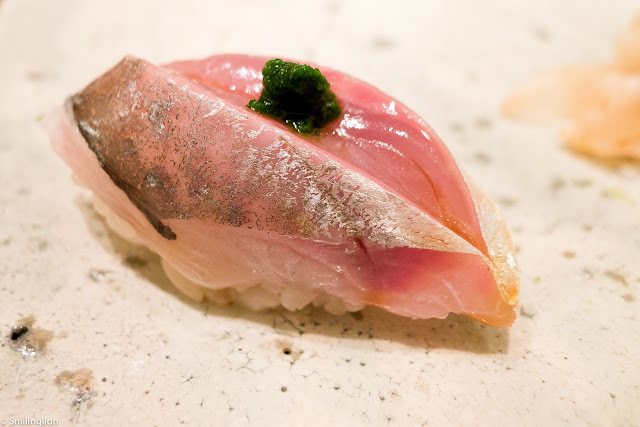 The aji (horse mackerel) was a beautiful piece of sushi, and had oiled chives on top of it to counter the slightly bitter taste of the fish. 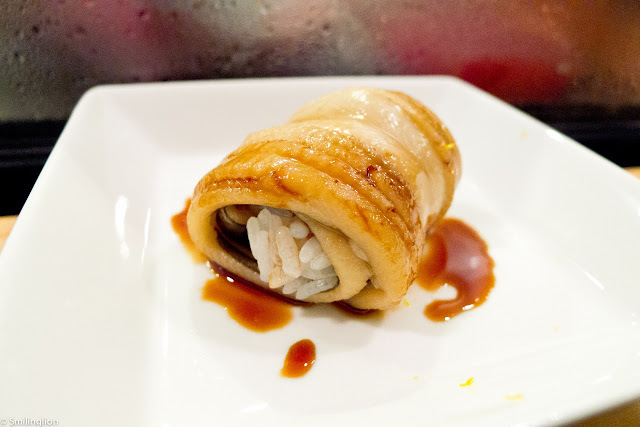 Finally, the anago (saltwater eel) wrapped over sushi rice. 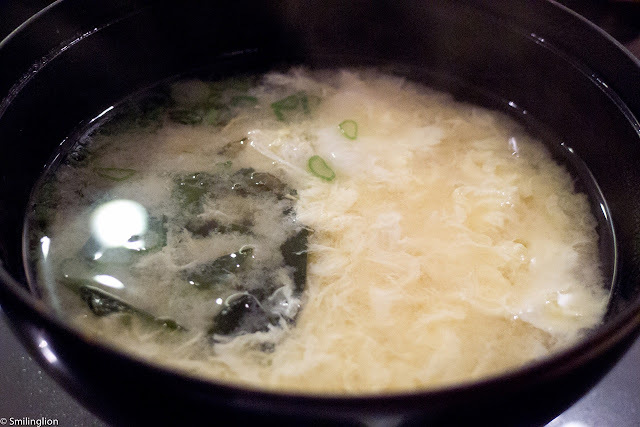 To round off the meal, we were served a refreshing egg and seaweed miso which was very light. Dessert was ice-cream as usual. 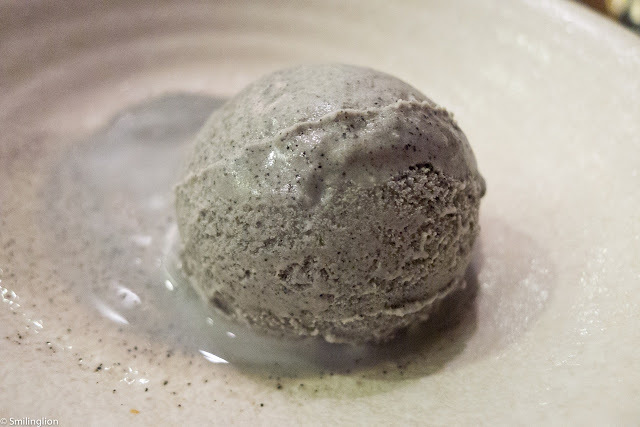 We shared a scoop of goma (black sesame) and champagne grape. 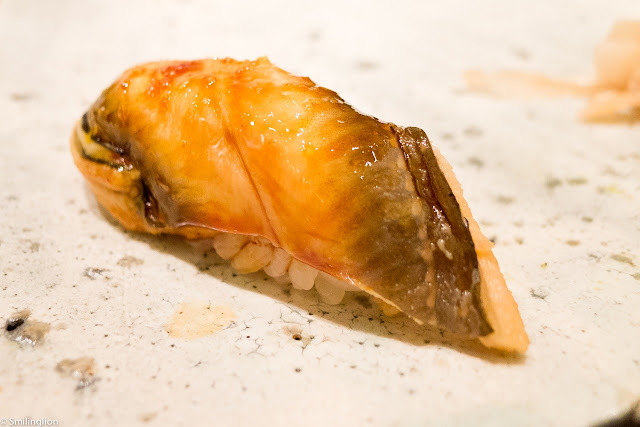 Final Thoughts: We love Hinoki for its incredibly value-for-money omakase; the dinner above cost US$100 per person (and that's including an extra piece of uni sushi but excluding the alcohol). 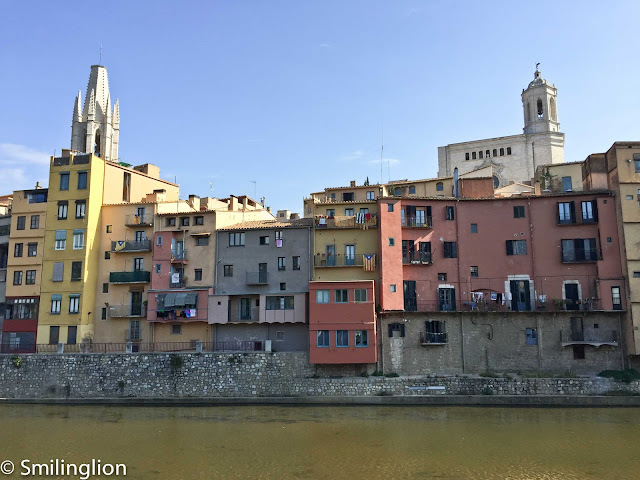 In addition to that, dining at the counter where Lawrence and Gary run the show is never dull, as the 2 chefs are as talkative as they are good at what they do, engaging us frequently and always sensitive to dietary restrictions or preferences of guests. Granted, purists may prefer to eat omakase prepared by Japanese chefs and Lawrence and Gary are as local Singaporean as they come (they often break out into Hokkien, the local Chinese dialect), but the food and ingredients we have had here have not been of lesser quality and the friendliness and humility of both the owner-chefs make omakase dining in Singapore a very accessible experience. A word of warning though, outside of the sushi counter, the service could be a bit suspect so we'd always only eat at the counter (as we'd not risk having to deal with the other staff who may be less attentive).